With over 10 years of leadership and management experience in the field of research, strategy building and networking, Mariam Safi is a peacebuilding practitioner in Afghanistan and was honored for her contribution in these fields by the Diplomatic Courier as one of their Top Global Women in 2014. As a committee member of over 10 influential working groups on gender, economics, security, peace-building and international relations, Mariam has had the opportunity to witness strategic challenges and has participated in the peacebuilding process in Afghanistan and the region. These experiences led her to found the Organization for Policy Research and Development Studies (DROPS), which helps bring women’s voices and perspectives into focus with local policymakers and the international community. In line with this, Mariam started the first peer-reviewed Women and Public Policy Journal and has trained over 30 young female researchers in public policy development. Furthermore, DROPS established the first network of Afghan women researchers and analysts to advocate publication findings to the policy community in Kabul. DROPS extraordinary work was acknowledged by H.E. First Lady of Afghanistan, Mrs. Rula Ghani who inaugurated DROPS 2nd Vol. of its Women and Public Policy Journal in November 2016. Mariam writes regularly for regional and international journals, is a member of the prestigious Afghanistan Policy Group, a Senior Fellow at the Institute of National Security Studies Sri Lanka, a Near East South Asia Center alumni, a local peace-building expert for Peace Direct, and a member of the Board of Directors of the Afghanistan Women Chamber of Commerce and Industries. She holds an MA from the United Nations Mandated University for Peace and a BA in Political Science from York University. 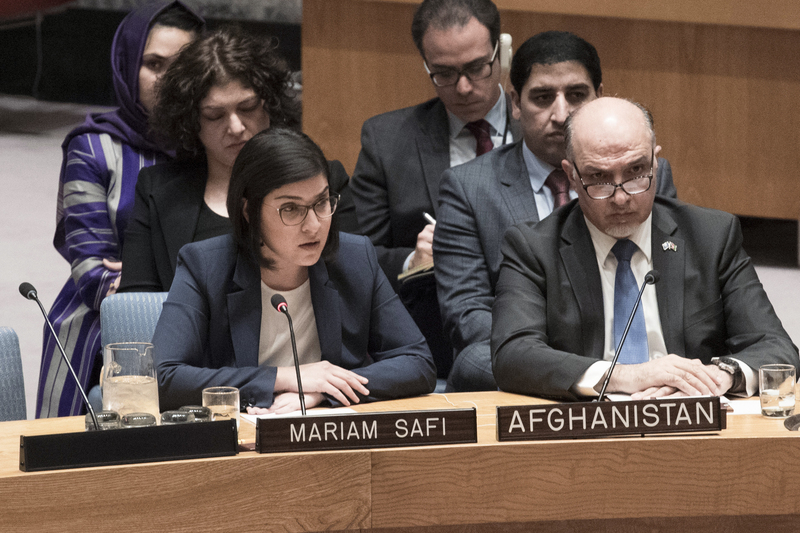 Mariam Safi, representing the Organization for Policy Research and Development Studies (DROPS) was invited to provide a civil society perspective and recommendations when the Security Council met to discuss the situation in Afghanistan. The NGO Working Group on Women, Peace and Security facilitated her statement but she did not speak on behalf of the NGOWG.